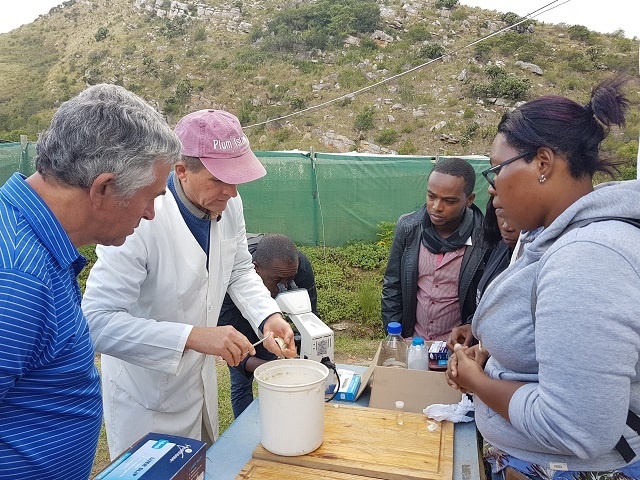 Four Seychellois are now better equipped to deal with fish health management after attending a one-week training course on fish health and biosecurity at the Rhodes University in South Africa. The participants were Jimmy Melanie and Erena Dugasse from the National Biosecurity Agency, Brad Uzice from the Seychelles Bureau of Standards and Veronica Alphonse-Uzice from the Seychelles Fishing Authority. The aim of the course was to introduce participants to fish health management with a focus on marine finfish aspects. It included diagnostics, pharmacology, water quality and fish stress management which are very important to farming fish at commercial levels. Alphonse-Uzice, the Senior Aquaculture Officer from Seychelles Fishing Authority said the course was very tough and intense but that participants gained a wealth of knowledge. The training of the four Seychellois is important for Seychelles, an archipelago in the western Indian Ocean, for the implementation of the aquaculture project due to start in August. The project will be located at a new facility at Providence – an industrial zone – on the eastern coast of the main island of Mahe, and it will start with four species of fish. These include the brown-marbled grouper, red emperor snapper, mangrove snapper and the snubnosed pompano from the finfish category. The aquaculture project is the first one under the mariculture masterplan which is part of the government’s plan to diversify the economy of Seychelles. It is expected to help reduce pressure on the fisheries sector, the second-most important part of the country’s economy. The aquaculture pilot project will provide concrete evidence on the feasibility of aquaculture in Seychelles’ waters. Seychelles has significant natural resources to develop its aquaculture base and aquaculture has been prioritised as one of the newest food-producing sectors. However, key support services to sustain the aquaculture sector in Seychelles are pivotal for its sustained growth.